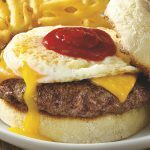 Cook your Burger to order (4-5 minutes per side on High Heat will usually yield Medium Rare). When Burger is almost finished cooking, add slice of cheese and allow to melt. For a quicker melt, use the Quick Steam method (see below). While Burger is cooking, in a small bowl mix together Ketchup and Sriracha Sauce (or other desired hot sauce) until fully combined. Set aside. On Low Heat, melt half of the Butter in a small pan. Once melted, crack Egg into pan and lightly season with Kosher Salt and Black Pepper. Cover and allow Egg White to crisp. When edges of Egg White are crisp, carefully flip Egg and cook for an additional 30-60 seconds (or until desired doneness). Remove from heat. Melt remaining butter in a pan on Medium Heat and place English Muffin inside down to toast. When English Muffin is golden brown and crispy, remove and set aside. 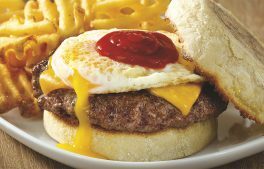 Build Your Burger: English Muffin Bottom, Burger, Fried Egg, Sriracha Ketchup, English Muffin Top.